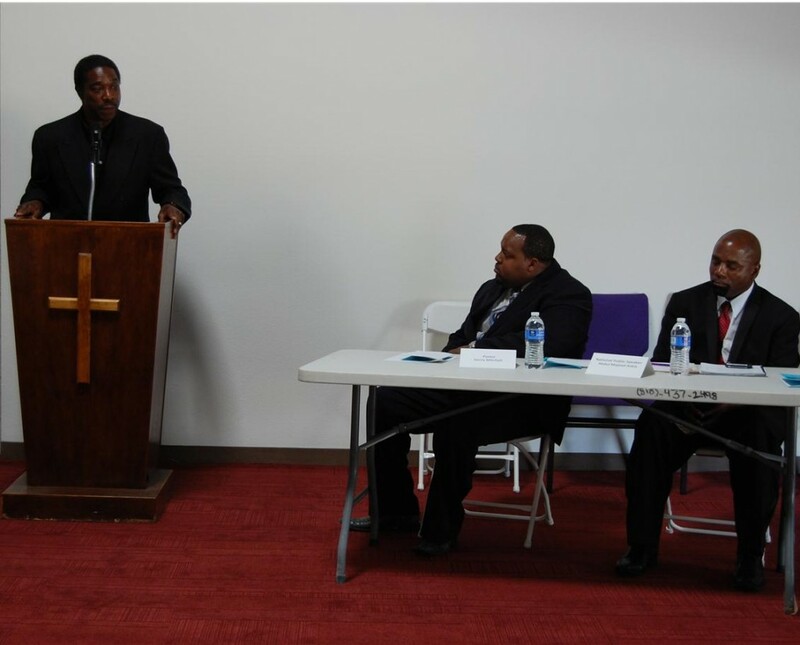 (L to R) Robert "Bo" Bynum speaks at the Community Roundtable Saturday, as Pastor Gerry Mitchell and community activist and public speaker Abdul Majeed Askia looks on. 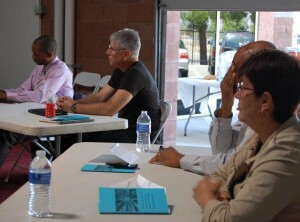 LANCASTER – About a dozen leaders from various segments of the Antelope Valley community gathered Saturday afternoon at the Agape Church for a Community Roundtable. Organizer and community activist, Abdul Majeed Askia, said the purpose of the roundtable was for various community leaders to pool their knowledge and resources together to tackle the most pressing issues affecting the Antelope Valley community today. “Education, crime, recidivism, and unity in the community across racial, cultural and ethnic lines,” Askia said. “We’re here to collectively and effectively address these issues in our community. Speakers at the roundtable included Robert “Bo” Bynum, Palmdale School District Trustee; Pharaoh Mitchell, President of The Community Action League; Juan Blanco, President of the NAACP – AV Chapter; Lilia Galindo, Director of Unincorporated Areas for the League of United Latin American Citizens; David Paul, Lancaster Human Relations Tapestry Commissioner; local pastor Gerry Mitchell; mediator Linda Atkins Hughes; local businessman Savi Masood from Valley Construction; and community organizers Larry Evans, David Marshall and Cary Sherman. The majority of the speakers stressed education as the key to addressing crime and unifying the community. 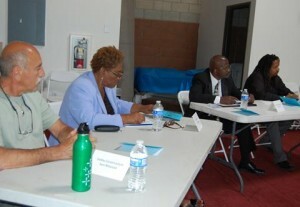 (L to R) Savi Masood, Linda Hughes, Larry Evans and Pharaoh Mitchell. “Education to me seems to be the core of how we reconstruct our society,” Bynum said, adding that rigorous education needed to start at the preschool level in order to counteract some of the negative influences some students faced at home. Bynum said he and other educators had initiated parenting classes in an effort to address some of the problems students may be facing at home. But he said many parents would attend initial meetings and then drop out due to lack of interest. He said it was now up to educators to succeed, in seven hours a day, where parents had failed. “So when we do release them to go home, the negative influence [from home] will be minimal,” Bynum said. Community organizer, Larry Evans, said religious organizations could play a more active role in addressing education and other social issues. Evans said church leaders should implore their congregation to volunteer in the schools. “Why can’t the people in those pews tutor the kids at the schools?” Evans said, adding that sermons should address social issues in addition to religious issues. Askia agreed. (L to R) Cary Sherman, David Paul, David Marshall and Lilia Galindo. Bynum said unity among the churches could spread the message even further. He said every pastor of every denomination and faith needed to bring their congregations together to one location and then preach a unified message that focused on solutions. Another surefire way to make a difference is through voting, said LULAC’s Lilia Galindo. She said the importance of voting was a message that was not getting through to the community, as evidenced by the 14 percent voter turnout in the Lancaster election on April 10. Galindo said, in addition to registering people to vote, leaders needed to figure out why the people already registered to vote appear to have no interest in voting. “I think that we have to work together and make a change, otherwise we’re going to continue with the same thing,” Galindo said. Juan Blanco spoke of the importance of putting character before color, Linda Hughes spoke of the importance of having a mutually respectful relationship with law enforcement, and David Paul spoke of the importance of seeing past race. “There is only one race, the human race,” Paul said. Askia said Saturday’s Community Roundtable was the first of several roundtables he would be organizing to address the problems that are hindering the growth of the Antelope Valley community. 14 comments for "Roundtable focuses on education and unity in the community"
learned person is harder of the devil than a thousand worshippers! person will reach millions ! One persona can make a difference! “Bynum said he and other educators had initiated parenting classes in an effort to address some of the problems students may be facing at home. But he said many parents would attend initial meetings and then drop out due to lack of interest. He said it was now up to educators to succeed, in seven hours a day, where parents had failed. – I appreciate the logic behind some of this “approach” – But I am left to ask why is it a teacher’s responsibility and burden to take over the roll of “parental” responsibilities when the parents have failed? Teachers should not have that burden placed upon their shoulders. Even the most dedicated educator doesn’t have that amount of time to devote to every student lacking parental guidance. True, a teacher or positive role model just might reach a few at risk kids, but ultimately the roll of parental authority should be at home. If a kids home environment is lacking the fundamentals of a healthy parental authority the buck should not be passed to the teacher – Educators are not babysitters and school should not be a “daycare” center for kids with parents who could care less. It isn’t a teacher’s responsibility to raise someone’s child, they have families of their own to look after. A big Catch-22 because if a kid is lacking parental guidance because mom/dad, either/or or both are running wild and far removed from any involvement with their children, most children will rebel from authority or any type of parental guidance or mentoring from an educator, or any person for that matter. Right or wrong, negative or positive, kids emulate their parents. If mom and dad don’t work, sleep all day, party all night, their kids see that as ‘normal’ and acceptable and sadly, very few kids in this situation are going to be persuaded to think differently. I applaud the efforts to get parents more involved in their children’s lives (what a concept, right?) – And I have seen the frustration and disappointment on the faces of people with good intentions, but ultimately it is the parents responsibility to do the right thing. We as a community shouldn’t further enable deadbeat parents by stepping in and raising their children for them; I’ve seen this before and it always ends on a sour note. Little Billy has no guidance at home, a devoted educator steps in and offers some guidance and support and all of the sudden little Billy’s mom comes out of the woodwork demanding justice, and accusing the system that she has milked for years of “over-stepping” it’s bounds. You can’t win. Even sadder, trying to get a kid like Billy to see that education, discipline and legitimate employment are the fundamental keys to a successful life, especially when Billy goes home and sees that mom/dad, etc have all of life’s luxuries (SUV, cash, high end electronics) – Yet nobody works and they sleep all day. Which path do you think Billy will take? Chances are quite likely that Billy will take any sage words or advice from a tired teacher who drives a worn out ’91 Honda with a grain of salt, especially when Billy goes home and sees how mom and Co have prospered without any of the fundamentals his teacher has spoken of. Yes we must break that horrible cycle, and of course a teacher or positive roll model can be that link in the chain, but to place all of the duties on the teacher and the school is illogical and at best, a pipe dream. Let’s go after these deadbeat parents who’s lifestyle’s are already instilled in the minds of kids like Billy. Easier said than done, I know. North county. Your response is what creates intelligent dialogue. approach we can make a difference. NCounty thank you for writing the truth..no one on this site has ever called it like it is. internally that you need to address. that are now honored in history was first vilified!!! imprisoned and even killed for what they believed in. be-headed and he actually became the leader of the church! on the side that recognizes that God created us all ! step up for the betterment of us all. genuine efforts to make this a better and safer community for us all. of the puzzle and play a part of completing the picture of community. world through rose colored glasses failing to see the light. all the participants,news media,cooks and organizers !!!!! I wasn’t there Abdul, but from the two articles I read (AV Press and here on this site) it sounds like the intentions are good, however read my post for my take on putting the parental responsibilities on the already overloaded shoulders of our educators; Your concepts and ideas are good, but I’m not sure they will work. Like I said before, Rome wasn’t built in a day, but we have the resources needed to lay a strong foundation. Keep on, keeping on. What I did find insulting however, was the broken record debate and allegations of racism by law enforcement against minorities. The statements made about speeding tickets and minorities living in fear of being murdered by law enforcement is pulp fiction and racist propaganda. I think a black man needs to fear his own people murdering him in cold blood before a cop ambushes him. Put a lid on the homicide by cop conspiracy theories. Your group pointed out names of 2 minorities shot by law enforcement recently – Yet there was no mention of the white parolee career criminal who was justifiably shot by the cops in Quartz Hill last year. Why not? If you’re group is going to address these issues, don’t select ones that inflate tensions while glancing over the other “non-minority” people shot by cops. Progress is never made when the only thing accomplished is an acute case of carpal tunnel syndrome from pointing fingers at everyone. Damn! NCounty you tell it like it is. I applaud you! What a reality check. Well argued and cogently put, NC. O boy… A “community” is made up of many races. But, it appears noone in the “community” cares about Abdul’s “think tank” frickin meeting! A-stupido!! Where are the pictures of the “crowd” that attended? It seems like your roundtable addressed some very important issues in the community head on. It looks like not that many people attended though and that’s too bad. I was a little skeptical about your roundtable and that’s why I didn’t attend. A lot of your comments on this site were a bit overwhelming and confusing, so I didn’t know what to make of you and your roundtable. Sorry to have judged you incorrectly. If you publicize your next roundtable, I will make an effort to attend. You seem sincere in your efforts to affect change in this community.